A method for categorizing content from a website associated with an enterprise company for ranking of said company, said method performed by a computing device having a processing structure and a memory including instructions executable by said processing structure to cause said processing structure to at least: request a uniform resource locator (URL) associated with the website validate the URL create a profile associated with the enterprise company and storing the URL in the memory automatically crawl the website for content and to create a site index parse the content to determine the occurrence of a predefined set of keywords pertaining to products and services and business activities of the company, and rank the keywords according to relevance pertaining to at least one category categorize the website into at least one industry category and determine whether the website is properly categorized. Categorizer of industry specific data and products based on HS and NAICS codes. This can be used for Customs calculation and other tools which currently do not exist in the market. We are open for an outright sale or a license with royalties. We are also open to partner up with a company that is willing to build on our idea. We are using the patent in one of our CompanyID products currently and has been successfully implemented into the system. There is a huge market potential for this system in the current B2B and B2C eCommerce platforms. 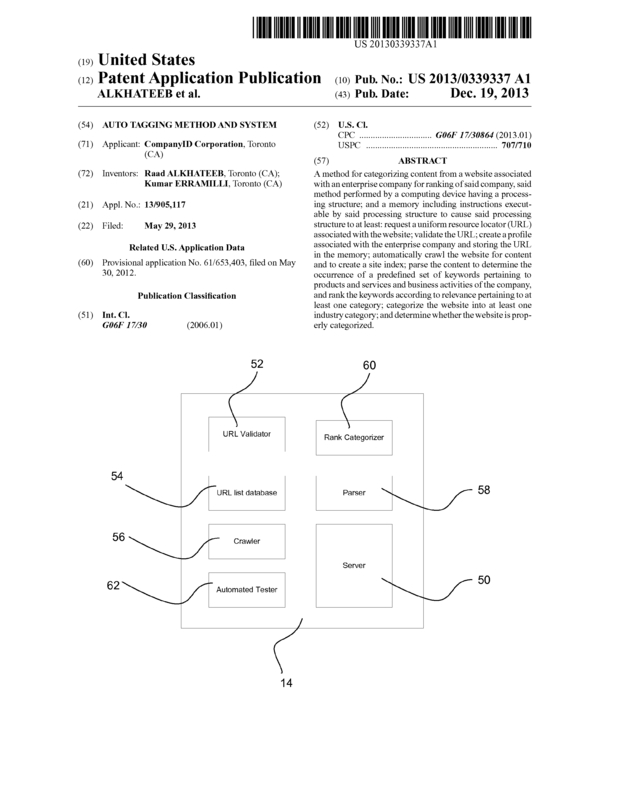 Page created at 2019-04-25 20:45:36, Patent Auction Time.